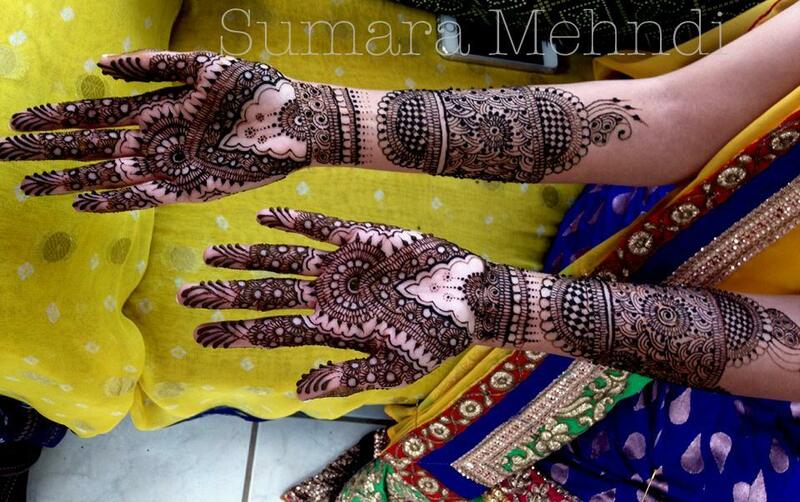 Mehndi artist Sumara Choudhry provides henna services in Philadelphia, Maryland, Washington DC and Virginia; US. 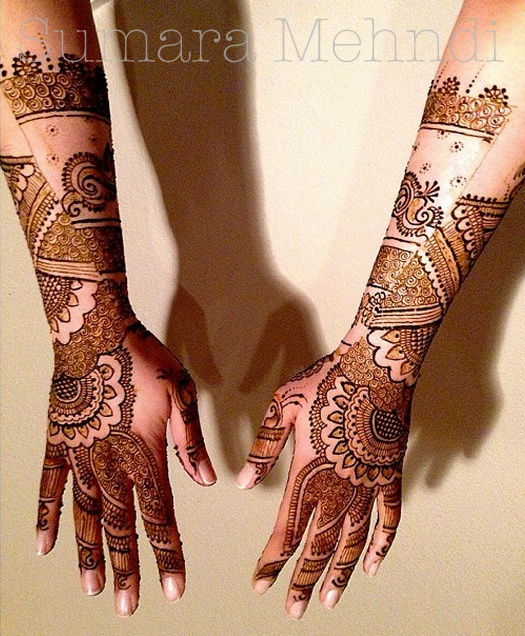 She is known for gorgeous, intricate mehndi designs. Her creative patterns, styles and design themes can enhance any special occasion of one’s life. From weddings to other celebrations, Sumara’s stunning mehndi designs are capable of making a woman’s festive experience more memorable. In order to provide the highest quality services, fresh homemade mehndi paste with pure essential oils for natural, dark color is used by Sumara. I am a professional henna artist and a graduate student in the field of medicine. My path to discovering henna and immersing myself into the art has been very unorthodox. I wasn’t the girl who “always knew” that henna was my passion. Growing up as a kid, I always loved the sciences, and knew my career goal in life would center on medicine. However, I found that having to live a structured life, surrounded by books and studying, was not always the best atmosphere to relax. I often found myself doodling or drawing to relax. In high school, I used to use sharpie markers and “draw henna” on my hands during many of my classes (usually calculus). I was known in my family to be the only one to adorn my hands with actual henna every Eid and Ramadan. However, I was by no means a professional, and was far from knowing the basics about being a professional henna artist. This all changed when I was 19 (I am 25 now). A close friend of mine, unable to find a mehndi artist to do his sister’s bridal henna, messaged me asking if I could “somehow do something”. Never having done bridal henna before, I gave it my best shot. Not only did the henna application exceed his expectations, but the bride’s friends all loved it too. I was a hit. Soon word got out about my “bridal henna”, and I started getting messages from various people in the community who were seeking a henna artist. The year afterwards, I did henna at about 20 weddings, without meaning to do so. 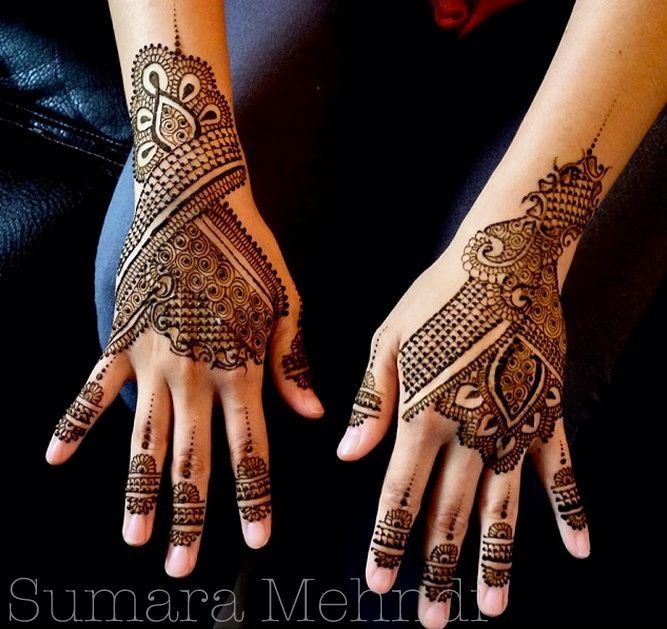 In 2012, I decided to launch “Mehndi by Sumara”, and continue what I loved doing. People always ask me, if I will continue to pursue henna even after completing my school. The answer is yes. Although I have a love for medicine, I have a passion for art. And to me, having a balance of both is extremely important. This is a design that I’ve frequently been requested to do. I initially did this design because lately I realized the “checker-board” pattern had been falling out of favor. I happen to love older, traditional mehndi designs, and so I decided to incorporate the bold checker design to stand up against the tiny intricate designs in the rest of the design. Since I first applied it, it has been one of my favorite designs. I can say many of the experiences I’ve had while doing henna have been very memorable to me. However, one in particular holds a special place in my heart. In the summer of 2014, during the height of the recent Palestinian Crisis, I decided to donate all profits made from applying mehndi at a chaand-raat festival to the Islamic Relief foundation. After having set up my table amongst a cluster of other mehndi artists, I realized that people were lining up at my table just to help in the Palestinian cause; individuals who weren’t even getting henna done donated money. It rained on/off that day, but still my line remained at least 10 people long at all times. As it got late, I realized majority of the other mehndi artists had left. I remember checking my watch at one point and realizing that it was close to 3 am, but there were still many people who had been waiting for hours (the end of the line was close to 3 hours of waiting) for henna. It was a humbling and overwhelming moment for me, not because of the high demand for my mehndi, but also because majority of the patience was fueled by the will to give to charity. I single-handedly raised over $1,000 that night, and all funds were donated to Islamic Relief the following day. 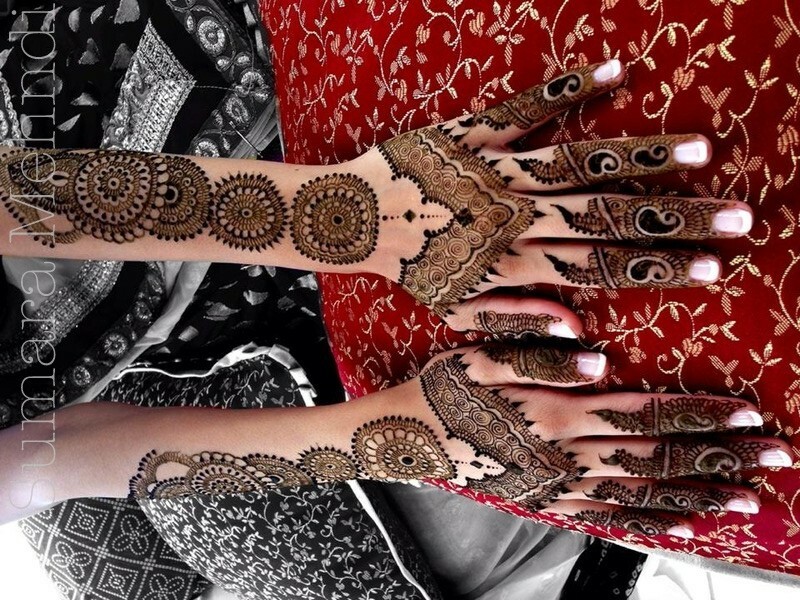 It was probably one of the most rewarding moments of my henna career. Leave paste on as long as possible: It is recommended to leave the paste on at least 5-to-6 hours or more. Leave paste on overnight for best results. The longer the paste stays on the skin, the darker the stain will be. 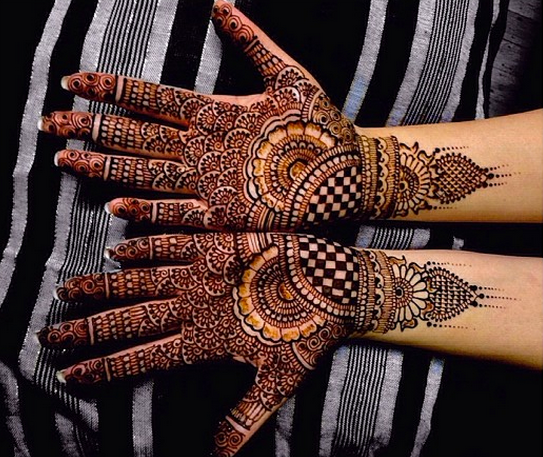 Heat and moisture help: The warmer the body temperature, the faster the mehndi will stain. If you are cold, try drinking something hot before you start. Gently steaming the area while the paste is on also helps. Wrap it up: You can wrap the area with an elastic bandage, paper medical tape or toilet paper. Wrapping isn’t required but it helps conserve heat and moisture, which help to make the stain darker. Also protects sheets if paste is left on overnight. I usually put a piece of toilet paper over the design, then wrap with an elastic bandage. If you want to use plastic wrap, be sure to wrap with toilet paper first to soak up any perspiration and to prevent smudges. Remove the paste; do not use water: You can use lemon juice or olive oil to remove the paste. You can also gently scrape the paste off or let it fall off naturally.Try not to get the area wet for at least 6-12 hours after paste removal although waiting a full 24 hours is best. The longer you prevent the area from getting wet with water, the better it is. Design will be bright orange at first and then gradually darken to brown. Mehndi stains take 48 hours to develop. Moisturize: Apply some kind of natural oil or butter after the paste is removed to protect mehndi design and prevent exfoliation. A lot of store bought moisturizers contain chemicals that can prematurely lighten the stain, so it’s best to use something. Avoid moisturizers with fruit acids (Alpha-Hydroxy Acid) or bleaching agents. You can reach me through my Facebook page; Instagram or take a look at all the pretty designs on my website.